Since we left Bastion just over week ago the CCT have covered a lot of miles both in vehicle and by foot. We flew into Main Operating Base Price in good time for us to sample the culinary delights of “MOB Nice” as it’s commonly known and also to meet up with the Warthog Group formed by The Kings Royal Hussars. It was an eventful few days spent in some sweltering temperatures in the back of the heavily armoured tracked vehicles whose task, whilst we were there, was to provide a security screen for the largest Afghan operation of the year so far. On the first evening I had a chance to put my night vision capabilities through its paces with the 26 Engineer Regiment whilst they reinforced a steel girder bridge in anticipation of the heavy access that would be required over the coming days. The Afghan ground troops were inserted by helicopter in the early hours of the following morning and began clearing the heavily contested area. Because the area was heavily seeded with Improvised Explosive Devices (IED)s it was a slow and deliberate process. 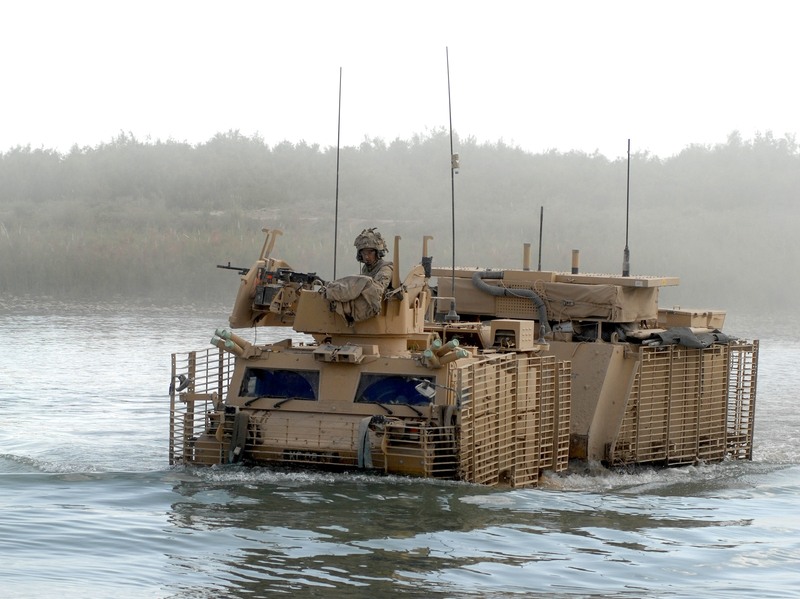 During our time spent with the Warthogs we saw the impressive manoeuvrability of the vehicles, and saw firsthand their ability to cover a variety of terrain, with the help of the Engineers bridging the gaps over canals and wadis. I think the most memorable part that will stay with me was filming with Andy out of the top hatch as we crossed through the Helmand River. A few minutes later we were filming the Warthogs mid- recovery of a vehicle from along its banks when they came under fire. Although the contact was fairly short lived and no one was injured, the recovery and the subsequent maintenance took the guys’ hours of physical and mental work, but the sense of humour and camaraderie never failed them. After leaving them we have spent the rest of the time between Patrol Bases Rahim and Clifton, both in the Upper Gereshk Valley, in the Green Zone. During this period we spent some time out with the Grenadier Guards and the Afghan Local Police. Due to a dose of luck and good timing we also happened to be there at the same time as the 12 Mechanized Brigade Commander Brigadier Doug Chalmers, so we were able to move out on a foot patrol with him along with various heads of the Afghan security forces. Patrol Base (PB) Clifton has been a really nice place to spend time at. Although facilities would be deemed as basic back home, out here it’s a well set up with a really good atmosphere. Andy and I got stuck into documenting life at Clifton pretty much straight away, with my first stop being the kitchen, eating being one of my favourite pastimes. Rob and Martin, the chefs here, serve up some pretty impressive meals with a lovely roast dinner one day, and cake and steak, another. 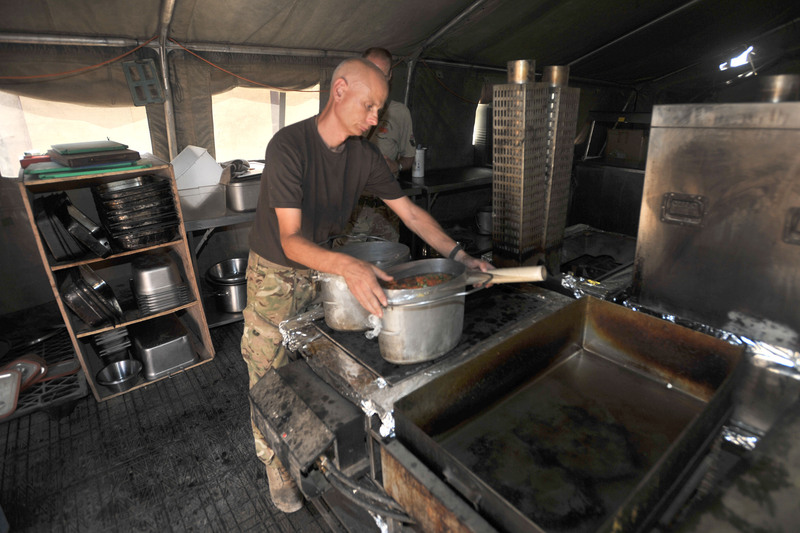 Depending on the deliveries, they serve a mix of fresh and frozen food, and also a mix of composite rations. The temperatures that they have to work in far exceed the ones outside, hitting the 70s for them on a regular basis. The kitchen and the food is an important source of morale for everyone at Clifton, and there is always lots of banter and laughter going on in the cookhouse. The washing facilities (known as ‘dhobi’) consisted of a washing machine cunningly disguised as a cement mixer and a welfare room which had a ping pong table, internet access and a TV and DVD player, and a makeshift outdoor gym. 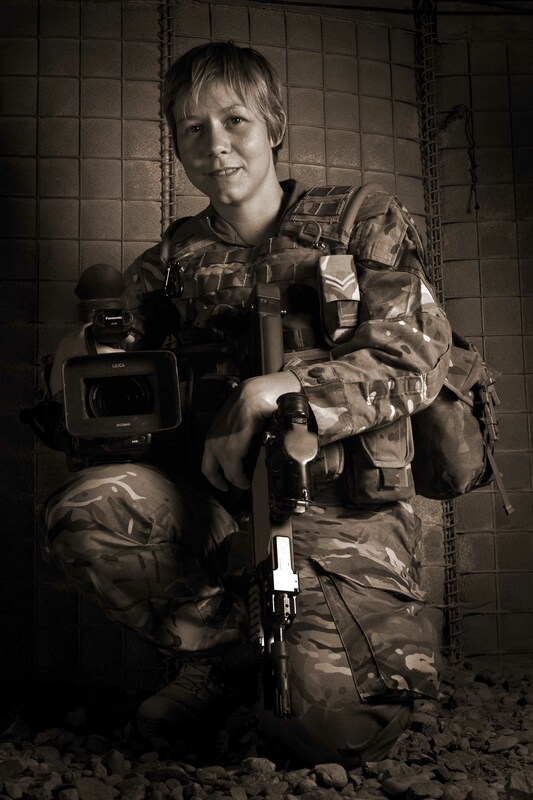 Captain Harriet Church, a Veterinary liaison Officer for the Provincial Reconstruction Team happened to be here whilst I was at PB Clifton, so I jumped at the opportunity to get out with her and her Afghan counterpart, a civilian who is known as a ‘Paravet’. Their role is to move around Helmand Province setting up short lessons for the local communities teaching them basic farming hygiene and feeding skills. Because many of the children here are the primary carers for the herds of cattle Capt Church is in the process of trying to implement this into the local curriculum, following the success of a similar process for IED awareness for the youngsters. Being out in the Kalays (villages) with all the children is always quite uplifting but it also makes me think about my nephews as well and how glad I am that they are lucky enough to be able to go to school, and not have to have lessons on how to recognise pressure plates and bombs. It definitely makes you appreciate what you would take for granted back home. Whilst you’re out here living in such close quarters to others, the heat and the physical exertion can take its toll. Some days you would just like a day off and it can be hard to muster enthusiasm for work, but then you come across stories like this and you see how little things like this can make such a massive difference to the next generations of Afghanistan, and it re-inspires and motivates you. We have only got a few more weeks here until our R and R (Rest and Recuperation) which we are all looking forward to. Before then we are in the process of trying to plan and fit in several jobs ahead of our R and R, including; Afghans training their Heavy Weapons, Counter IED Training as well as some electrical and driver training. I think it’s going to be a real mix of stuff going on and will certainly keep us busy before we get a chance for some much needed down time. 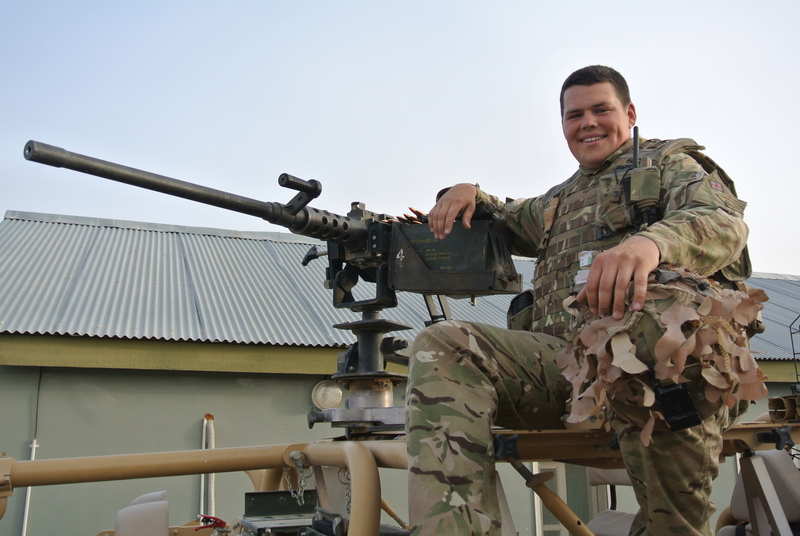 Trooper James Campbell is a member of the Headquarters Squadron of The King’s Royal Hussars (KRH). He is based in the Combined Force Lashkar Gah (CF LKG) Main Operating Base (MOB). The KRH are the lead unit for the Lashkar Gah area. 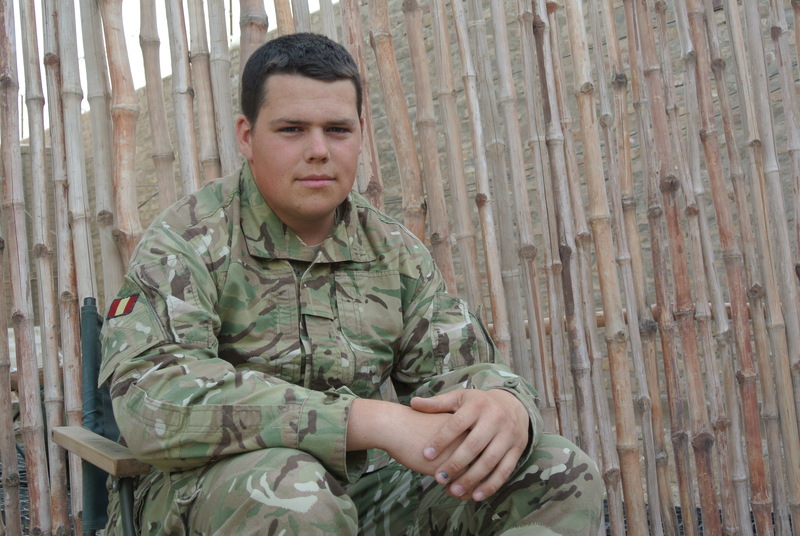 Today is the 2nd May and I have almost been in Afghanistan for a whole month. The training we first conducted when we flew into Camp Bastion seems like last year, as my time here so far has flown by. We arrived into Bastion in the early hours of the morning on 4th April, so I didn’t see much of the camp but we were informed that it is a similar size to Reading. We were shipped to our accommodation, which consisted of 70 man tents with bunk beds, an experience in itself! Especially as the travelling from England to Bastion had been pretty hot so showers were needed for many! In the morning we woke to begin our training. As soon as I stepped out of the tent I was blasted with the temperatures outside that were around 30 degrees and these will continue to rise as it is not even the middle of the summer. Looking back at our time in Bastion I can now understand why we had a couple of weeks in theatre at a slightly slower pace to acclimatise. The training in Bastion lasted just over a week and taught us the most up-to-date techniques needed to operate safely in theatre. The training was good as it gave me a bit of time to adjust as it would have been difficult to go straight out onto the ground. 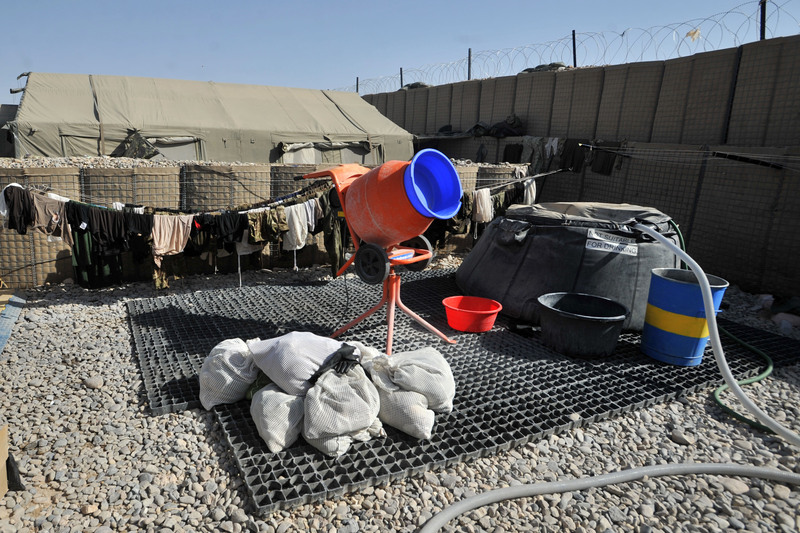 A week later we flew to Lashkar Gah also known as ‘Lash Vegas’ – not because of the alcohol as there is none in theatre but because of the good living conditions provided at the camp. This would be where I would be spending my next six months. My mates and I, who are in the same team known as a Patrol, moved into a large room together and straight away we started to make it a bit more like home. Some of us bought rugs and posters went up quickly. I am part of the Commanding Officer’s force protection team called the CO’s TAC group. This ‘elite’ team, as I like it to be known as, provides the CO with protection when he has to go out to visit local public officials. We are a really close-knit bunch of lads and we all get on really well together. Me and the some of the equipment I use in Afghanistan. Since being in Lashkar Gah we have been on many patrols. I normally provide all round protection from my vehicle with a 50 calibre machine gun that is mounted on top of it. My job is to protect our patrol from any attack that may happen, so I act as more of a deterrent but it is quite a responsibility and I really enjoy it. The first patrol was pretty daunting to be honest which we did on our second day in Lashkar Gah. I would be lying if I said I was not nervous but shortly into the patrol into the centre of Lashkar Gah (the capital of the Helmand province) the environment seemed very relaxed. There were many locals who were waving and seemed happy to see us. However, one child had the accuracy of Phil ‘The Power’ Taylor with a stone landing very close to me. Overall though, I was surprised to see how much the centre was thriving with business. In our spare time when we are not working we do get some time to chill out and as we have our own welfare facilities we can spend time on the PlayStation and watch DVDs and plays darts. We have even got competitions going on the PlayStation which is great fun! Outside of patrolling our daily routine tends to consist of maintaining the vehicles that we use and also building a few extra comfort areas where we can relax at the end of the day. Yesterday we spent some of the day building a gazebo like structure; admittedly it was not quite a Homebase piece of work but it was close enough. To be honest I think we could do our own Ground Force programme. I have now been out on a number of patrols and it is really interesting to explore the local area and meet many of the locals. Sometimes being inside the base it feels as though you are away from the real environment outside. The time on the ground with the Afghan Forces doing some patrolling has surprised me as I was not expecting them to be so professional. I am looking forward to working with them more and I hope over the next few months when I write my other blogs to tell you all about it.